The Layger Brewhaus brewing philosophy can be summed up in one word… Sparge! None of those people said those things. However, they are all correct: sparging is critical, refreshing, scary, and fun. Boil a bunch of water. Crush up some tasty grains. Stick ’em in a big sock. Drop the sock in the boiling water for awhile. Layger Brewhaus will now tell you what “sparging” is: Sparging is a metaphor for life. To sparge is to make major, brew-altering decisions without full prior knowledge of the possible consequences. To sparge is to rely on intuition rather than the explicit, written knowledge of the vastly more experienced. To sparge is to use one’s discretion, exercising restraint with repugnant, traditional beer ingredients like “beer finings”. To sparge is to dare, to dream…to pretend that 100°F is “cool enough” to add the yeast after 2 hours of waiting. Jon enjoys a self-sparge. No, really. That’s a thing. In short, to sparge is to be foolhardy, relying on sheer dumb luck, millions of years of evolution, the bombproof recipes of America’s homebrew industry, and the gumption of our forefathers. More technically, to sparge is to rinse the spent grains with hot water then discard them. Much like we at Layger Brewhaus discard our worries, cleansing our souls with beer and our bodies in the hot tub! Join us, then, in taking up the call of “Sparge!” as more than just a brewing technique, but as a metaphor for life. I, [your name here], hereby pledge to be foolhardy, to rinse my worries away with beer, and to remember always that the first guy who brewed beer had no idea what he was doing… and look how that turned out. Doo doo doo doo doo doooooo—SPARGE! Taking up a new hobby usually involves spending too much money on things that might or might not make a difference in enjoying your new hobby–or in how good you are at it. Here are a few of the things that have made a difference for Layger Brewhaus. Write your own recipes. Start with a goal flavor profile in mind. Look up some recipes online and see what they have in common. Then start writing down a recipe that will achieve your flavor profile. I’ve been doing this for about half the time I’ve been brewing, and it’s made brewing much more interesting. Anyone can follow a recipe. But if you write one with a goal in mind, you are actually trying to control your own destiny, which will make you a better, more creative brewer. Always make a yeast starter. 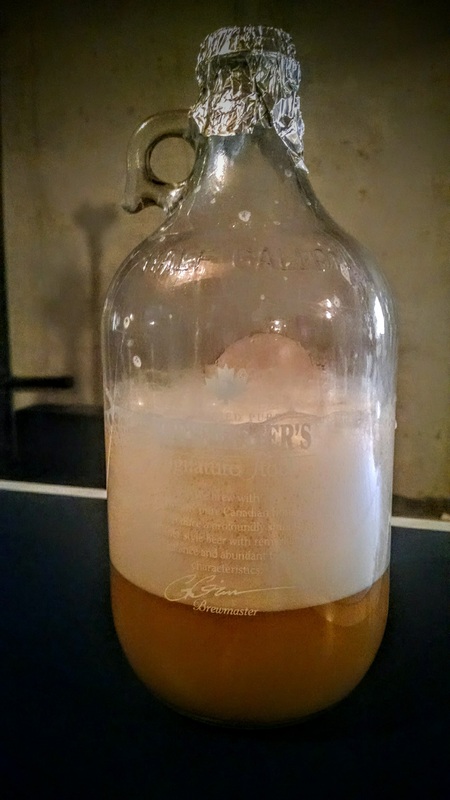 Since I started making a yeast starter, I have not yet brewed a batch that’s tasted a little off, a little funky, etc. Basically what you do is double the amount of yeast that you pitch. You can do this easily by just buying two of the same yeast packs/tubes, but you can also make it yourself with one yeast pack, a growler, some dry malt extract, and a little advance notice. Here’s how to make a homebrew yeast starter. Star-San sanitizer. It’s so much better than bleach! It’s much easier to use. It costs more than bleach, but you can re-use it a few times. It won’t destroy your clothes or your ability to smell. Also, it won’t eat off your fingerprints the way bleach seems to. Use glass carboys. After a few brews, the plastic buckets that make up beginner brewing kits start to make every brew taste kinda the same. Glass can be harder to get squeaky clean, but it doesn’t scratch like plastic meaning a glass carboy will stay cleaner than a plastic one. Use some grains. Extract brewing (using that syrup-like stuff) is easy, but you’ll start to notice that extract brews start to taste the same. Partial mash (using mostly syrup but also some actual crushed grains) is almost as easy as all-extract brewing but it makes much better beer. Leaf Hops, every time. Pellet hops will sort of dissolve in your wort and contribute to the big sloppy mess that is home brewing. Don’t cut corners: spend a couple bucks more and get real leaf hops and a little nylon sock to keep them together during the boil. You’ll get better hops flavor with much less mess. Those big gas burner things: Don’t bother with them. Sure, they might keep your wife happy not brewing up the house, but they mean you have to lug stuff around a lot and worry about if you’ll run out of propane, etc. Just clean the stove and the kitchen really well when you’re done and you’re all set! The ice bath. Don’t try to ice down your wort in the sink. It takes forever. 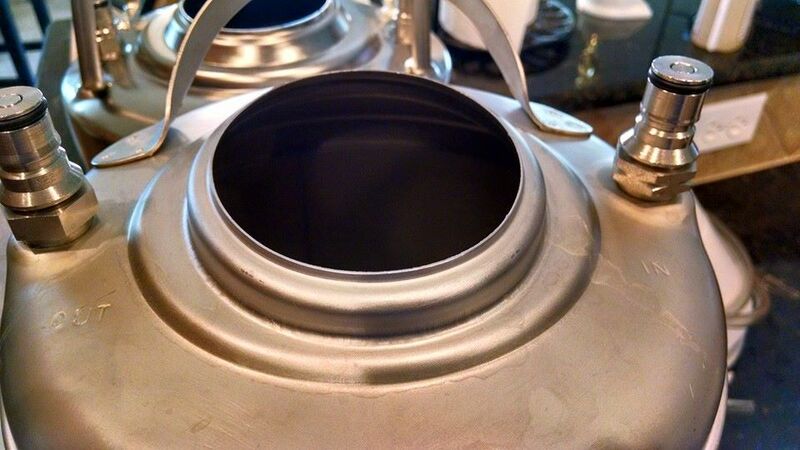 Get a Coleman-style cooler or big plastic tub (like a keg icing tub) that your brew kettle will fit in. We used to wait hours for wort to cool, and now I can just swish the brew kettle back and forth in an ice/water cooler and cool the wort in about 10-15 minutes. Those “chiller plates” are amazing, too, but they cost a lot, you have to run your hose into/out of them, and they can clog. A simple moving ice-water bath is easy and cheap. Always secondary ferment. We used to ferment our beer and then put it straight into the bottles, which is why we ended up drinking cloudy, yeasty beer. While it’s extra trouble to drain your carboy into another carboy to let it basically keep it doing the same thing, you essentially filter out most of the yeast, hop sediment, and any adjunct sediment. The result is a much clearer and cleaner tasting beer. Kegging really is better than bottling. Yes, it requires buying kegs, CO2 hoses/regulators, a CO2 tank, and the CO2. And, yes, it also requires a fridge to keep it cold, but it’s so much easier to clean/sanitize a keg than a million bottles. And you can force carbonate your beer, which is much easier and more controllable than adding bottling sugar. (About once a year, we’d overcarbonate part of a batch and dump a bunch of foam down the sink.) At the very least, bottle in 22 oz bombers or big 1-liter swing-tops! A chest freezer will open up half the beer world. Ales are just half the beer family and they’re aged at temps in the 60s. Lagers are the other half of the beer family and they’re aged at colder temps that require consistently weather, a cave or cellar, or a fridge. If you’ve got about $250, you can buy yourself a cheap GE chest freezer from Home Depot, a thermostat from Northern Brewer, and you’ll have yourself an awesome temperature controlled place for ales AND… (wait for it) for lagers! Home brewed lagers are awesome and you really can’t make them unless you have a way to get your carboy down to 34 degrees and keep there for 4-8 weeks. A chest freezer with a thermostat is a really good way to go. And when the beer is done fermenting, you can keg it and have a kegerator/keezer. Add yeast and shake well. The yeast will multiply for 24-36 hours. If you’re brewing on Saturday evening, start your starter on Thursday evening. Periodically stir, shake, or otherwise agitate your yeast starter. This helps in several ways. After 36 hours at room temp, move your yeast starter to a fridge to prevent spoilage before you brew.